ECJ decides that if the work is already freely available, providing access to the freely available work is not infringement. Very little in international intellectual property is more controversial than the internet. Hosted on the internet are millions of pieces of intellectual property – articles, blogs, software, logos, and trade names, just to name a few. Balancing protection for the authors with the aim of widespread information access has proven difficult, to say the least. Last Thursday, February 13, 2014, the European Court of Justice (“ECJ”) decided that clickable hyperlinks to a protected but free work on another website do not infringe copyright law. Nils Svensson and Others v. Retriever Sverige began in the Swedish courts. Retriever Sverige is a Swedish company that operates a website. The site provides hyperlinks to articles published on other websites. The plaintiffs were Swedish journalists that had press articles published on Göteborgs-Posten, a Swedish newspaper’s website. Retriever Sverige had linked these articles without authorization from the authors. 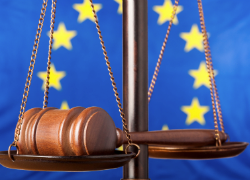 The Swedish Court of Appeals requested a preliminary ruling from the European Court of Justice on the interpretation of the EU Copyright Law. The ECJ first decided that a hyperlink is an “act of communication of a work to the public” as required by Art. 3(1) of Directive 2001/29/EC. However, the ECJ went on to say that to be protected as a communication to the public, the communication must be “directed at a new public.” A new public is one “that was not taken into account by the copyright holders when they authorized the initial communication to the public.” Simply adding a clickable link to the original article that was provided freely does not qualify as a communication to a “new” public. Therefore, if the users could have accessed the works directly on the original site, the hyperlink is not infringing the journalists’ copyrights. The ECJ does clarify that if a hyperlink is not to a freely available website, but to one that is protected, restricted, or only available to subscribers, that link would not be to a new public and would therefore be a violation of copyright rights. As the European Union is often instrumental in the proliferation of new copyright regulations, anyone who provides hyperlinks to websites (such as The View From Above) are currently breathing a sigh of relief. In reality, though, the ECJ’s opinion is fairly common sense and consistent with other copyright regulations. If the work is already freely available, providing access to the freely available work is not infringement. If you would usually have to pay for it, providing access is infringing. Any other decision would be inconsistent with established law – meaning it would create confusions and probably not be followed by other states – as well as impractical – meaning it would probably not be enforced. While many quirks about the internet and intellectual property are still being worked through, this is one for which many site operators should be quite grateful. If lucky, the hyperlinks question will remain resolved as the ECJ has done it, but if not, Svensson serves as good precedent for other courts. Samantha Peaslee is a 2L and the Managing Editor on the Denver Journal of International Law & Policy.